To reduce injuries and fatalities related to traffic accidents in all NYC boroughs, the Vision Zero action plan rests on 4 pillars: Law Enforcement, Legislation, Street Design and Public Dialogue. Involving the communities from the ground up by listening to their specific safety concerns and have the DOT and NYPD work with them to develop traffic safety plans is an important step in having New Yorkers in every borough embracing and promoting the message that traffic deaths are preventable. 7 Vision Zero Town Halls have already been held in Brooklyn, Queens, the Bronx and Manhattan and a few more are planned in May and June in the same boroughs as well as in Staten Island. 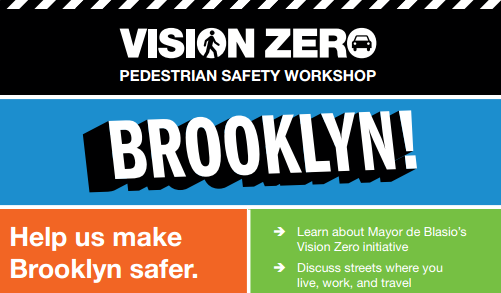 This week the first Vision Zero Workshop kicks off on April 24th in Plymouth Church at 75 Hicks Street, Brooklyn. Another workshop will be held in Brooklyn on April 29th at the Brooklyn College. Residents of these neighborhoods are invited to these interactive workshops during which they will be invited to voice their concerns and submit proposals to reduce traffic accidents in their community. Participants will join in mapping activities to pinpoint dangerous areas where pedestrian and bicycle accidents are occurring. They will also be invited to take part in small discussion groups moderated by the DOT and NYPD staff.